Although not as dramatic as the Great Wall of China or as fascinating as the city’s world-famous terracotta warriors, the Xi’an City Wall is nevertheless one of China’s more important ancient monuments. 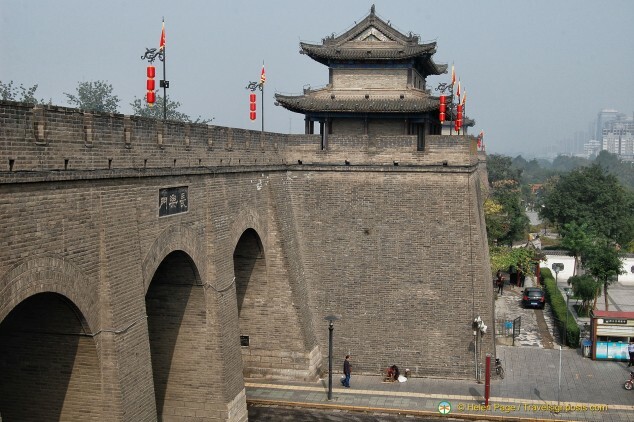 First built in the Sui-Tang Dynasties, the wall enjoys a history of more than 1,400 years and is one of the oldest and best preserved military defense systems of any ancient Chinese city. 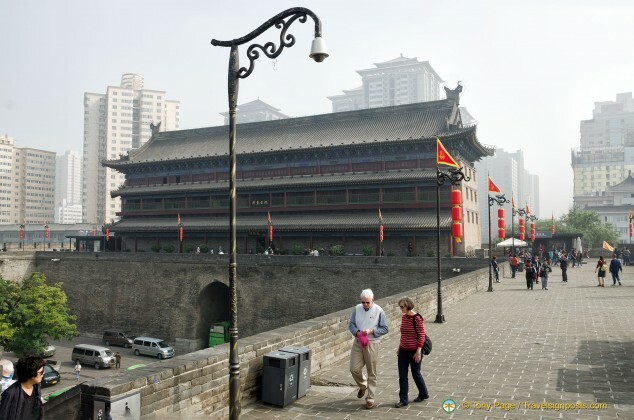 Situated in the centre of the old city, the Xi’an City Wall that stands today is the work of Zhu Yuanzhang, the first emperor of the Ming Dynasty (1368-1644). 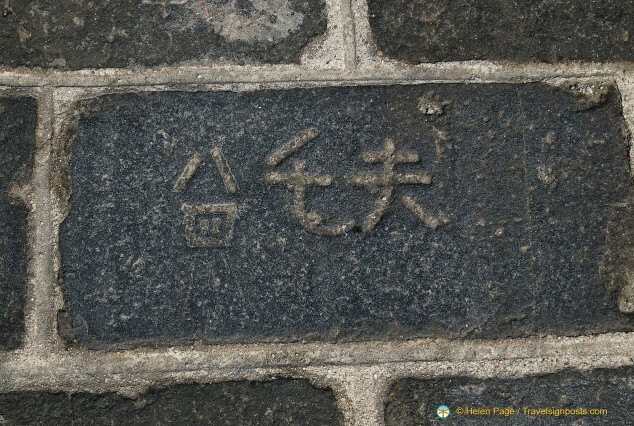 When Zhu Yuanzhang became emperor, he was ticked off by a hermit by the name of Zhu Sheng for not having a high city wall. The hermit’s advice to the emperor was to “build high walls, store abundant food supplies and take time to be an Emperor”. The Emperor took heed of the hermit’s advice and the extended rectangular-shaped city wall, with an outer perimeter of 14 kms, now stands at 12 metres high, 12-14 metres wide at the top and 15-18 metres wide at the base. 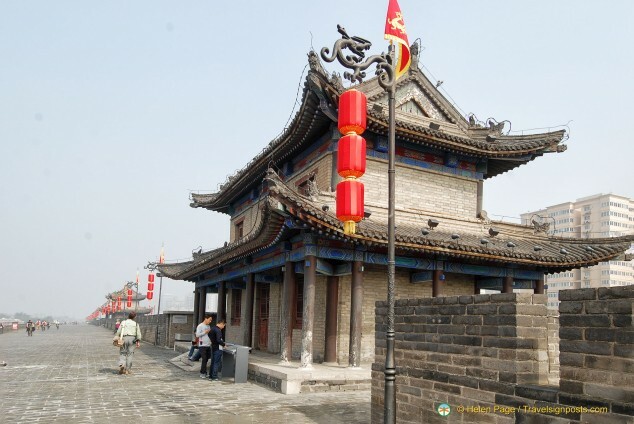 There are four main gates to the Xi’an City Wall, namely Changle in the east, An’ding in the west, Yongning in the south and Anyuan in the north, although these days there are many more small entrances to the wall. Although the south gate (Yongning) is the most beautifully decorated one, we arrive through the east gate whose barbican is now a parking lot. 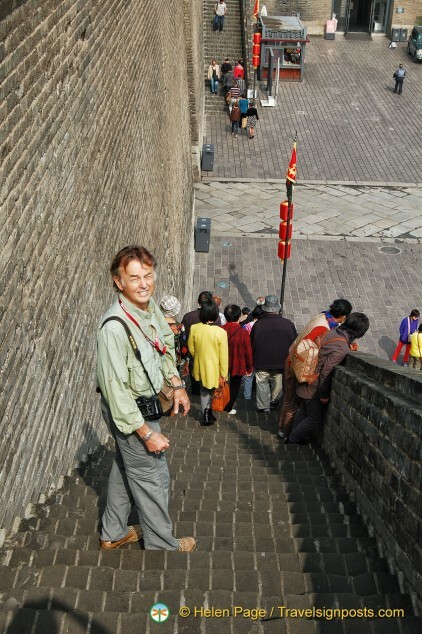 A long set of steps takes us to the top of the wall – it’s certainly much easier than the Great Wall of China. 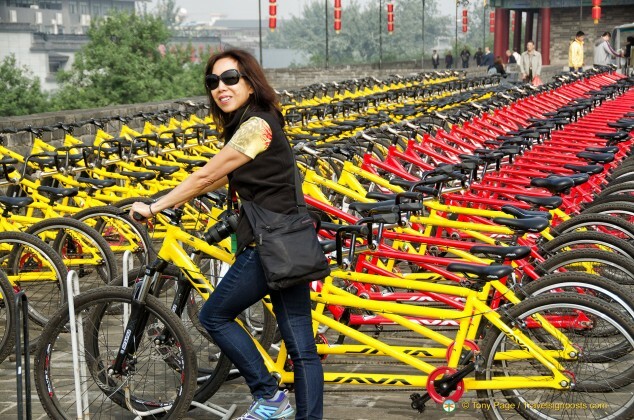 Once on top of the wall, you can hire bikes to cycle around the wall. As you can see, there certainly are plenty of bikes for hire. 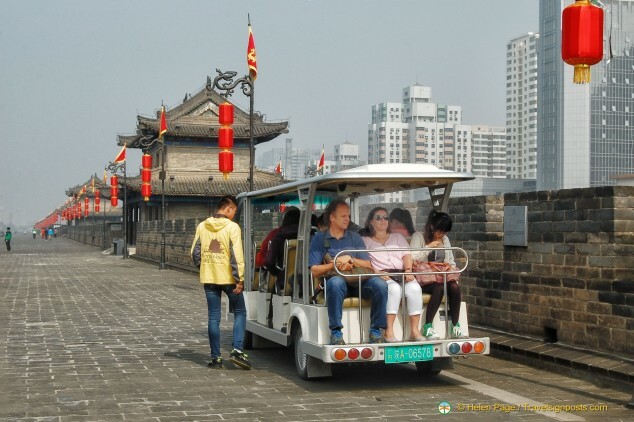 If you can’t cycle, there are battery-operated buggies that can take you around the wall. 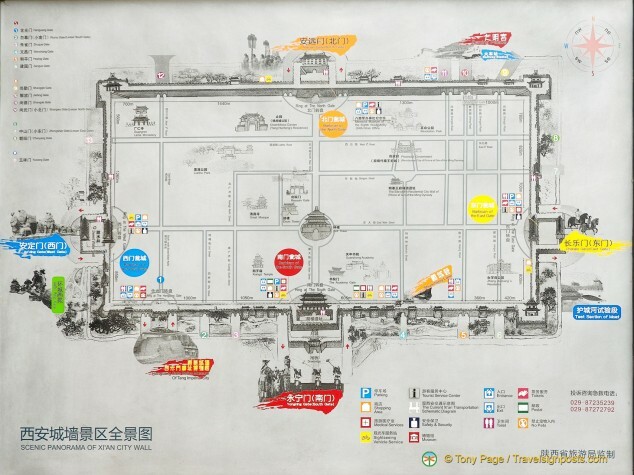 You can ride round the whole wall for Yuan 80 (2014 price) or do just a section of it, which costs Yuan 20 from one gate to the next. It’s 11 a.m. and the temperature is already quite hot so riding on the buggy seems like a sensible way of getting around quickly. But then we find out that there’s no set timetable for these buggy rides and therefore no guarantee that we will get back in time for our coach departure. 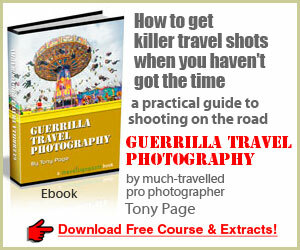 They seem to work on the basis that once the buggy is full, it takes off. If you plan on riding these battery-operated buggies, be aware of your timing. The ride around the whole wall takes about 70 – 80 minutes or if you do just one section of it, you’ll need to allow time to get back. 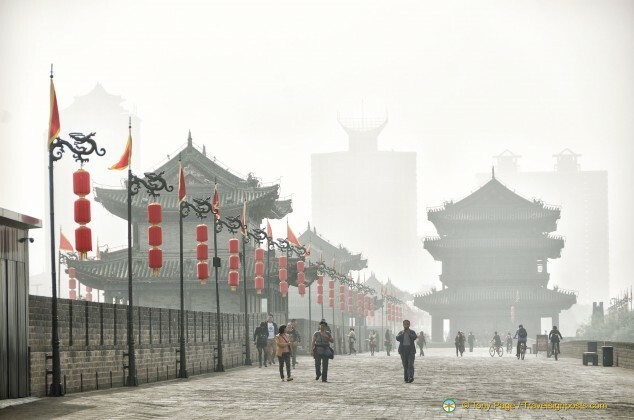 Having ruled out the battery-operated cart, we decide to walk the wall which turns out to be a good decision, in spite of Xi’an city being covered in haze. All along the wall there are information boards that explain about the defense system of the city wall. 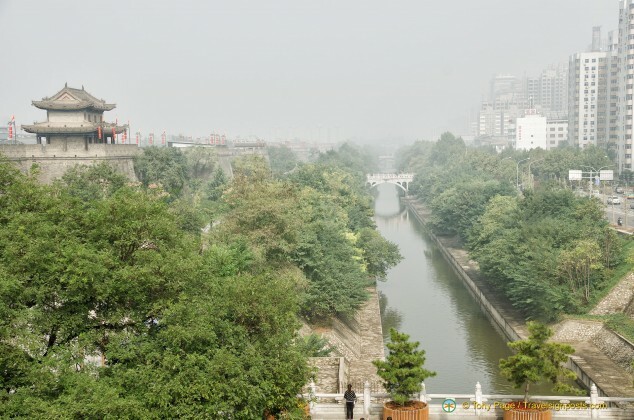 Xi’an ancient city defense mechanism consists of the deep moat surrounding the wall, the drawbridge, the portcullis tower, the archery tower, the gate tower, the corner tower, the watch tower, the parapet, the battlement, the ramp and other military installations. There are 98 ramparts on the wall and each has a watch tower from which the soldiers could protect the wall without exposing themselves to the enemy. The ramparts stick out from the main wall and are spaced every 120 metres, making each rampart 60 metres from the strategic crossfire point of arrows shot from either side. The wall was originally built out of rammed earth and was rebuilt with bricks for the first time during the reign of Emperor Longquing. Along the wall are some bricks with markings on them to indicate that they are from the original wall. A leisurely walk around the Xi’an City Wall when the temperature is a little cooler is ideal, but we unfortunately have to see as much as we can within our hour’s visit. It was quite rushed, but we nevertheless enjoyed the visit. You can see more photos of the Xi’an City Wall Here.